Crestron Electronics, world leaders in workplace technology as well as home automation solutions, have this week announced the next generation of their DM NVX Network AV solution. DM NVX now boasts Pixel Perfect Processing technology which, according to Crestron, makes it the only network AV solution that delivers a flawless image every time. Crestron have delivered that further improved image quality by working with partners such as Intel and intoPIX. According to the company’s announcement, the quality is now so high that you can’t tell the difference between DM NVX video and a direct video feed. In common with previous iterations of DM NVX, the new generation also boasts no latency, and supports more video formats than any other manufacturer’s network AV solution. As well as improving image quality, Crestron have also grown their DM NVX product family. The new DM-NVX-E30 and DM-NVX-D30 have both been added to the range. They are encode or decode-only units that support HDMI connectivity and analog audio. 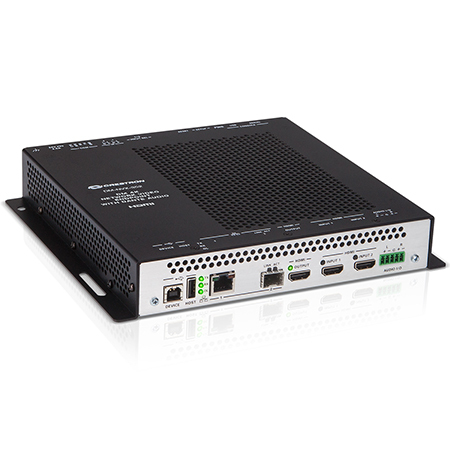 The company’s DM-NVX-352 with Dante audio networking and AES-67 audio, meanwhile, is also now shipping. If you would like to discuss your requirements for Crestron workplace technology or other solutions please call us on 0800 195 4825.